Kyle Bronson is in trouble already. The team broke a valve spring while warming up the motor. He will drive the backup #6 for Blake Spencer. Earl Pearson Jr is quickest in group A. He turned a 13.127. Bloomquist is quickest in group B with a 13.442. Earl Pearson Jr and Michael Page trail the pace truck ahead of the first heat race of the night. Green, Pearson leads on the bottom. Page is hung on the high side. Lanigan and Clanton slip by him on the inside. Page to 4th. Lap 3, the caution is out. Spin in turn four. Green, Pearson leads. Canton takes over 2nd. Pearson is driving from them all. Earl Pearson Jr wins the first heat race of the night! Chris Madden and Casey Roberts set the front row for heat two. Green, Madden is clear before turn one. Davenport is on the gas around the top in turn one. Move him to 3rd. Davenport remain on the high side. Ge’s working on Roberts. He pulls ahead heading to turn one. Davenport chops to the bottom and takes the lane away. Caution, spin in turn four. Green, Roberts works back around Davenport. He’s still fighting. Satterlee sticks his nose in there to make it three wide off turn two. Roberts holds 2nd off turn two, Davenport third. Lap 7, slow car in turn two. The caution is out. Green, Madden leads by three car lengths. Davenport is still trying on the top. He can’t make it work. Madden wins the second heat race of the night! Scott Bloomquist and Brandon Overton will lead them to the flag in heat three. Green, Overton leads on the top into turn one. False start. 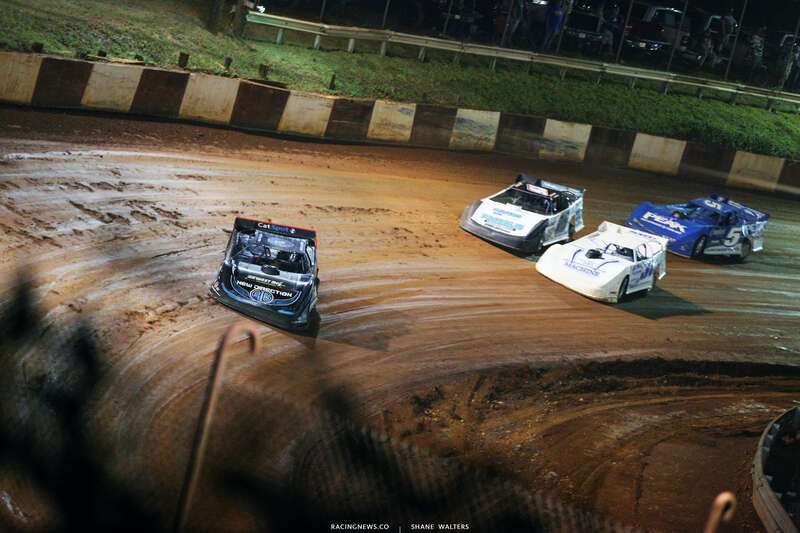 Green, Bloomquist slides Overton in turn one. Overton might have had to lift a little. Millwood gets a run on the bottom. Millwood clears Overton in turn three. Overton is still losing spot. Move McCreadie to 3rd. Lap 5, Bloomquist leads Millwood by 5 car lengths. Scott Bloomquist wins heat race number three! Dennis Erb Jr and Jimmy Owens lime up on row one for the final heat race of the night. Green, Erb noses ahead on the bottom into turn one. Owens fights back on the high side off turn two. The leaders run even. McDowell and Richards bang wheels off turn two. McDowell gets sideways but saves it. Owens is still fighting for the lead. He gets a run back in turn two. He’s clear into turn three! Caution. Zeigler is around in turn four. Green, Richards heads to the top in turn one. He’s clear of 2nd. He’s looking for the lead but can’t get to the right rear of Owens off turn two. Caution. Spin in turn two. Green, Erb takes 2nd on the high side. Richards is on the gas early on the bottom. Richards retakes 2nd off turn two. Owens is driving away. He takes the win in the final heat race of the night! 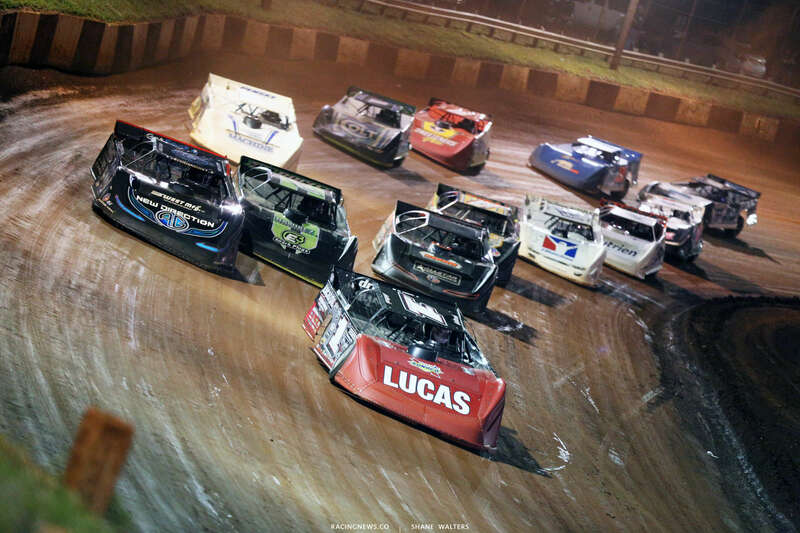 Earl Pearson Jr and Scott Bloomquist will set the front row for the 50 lap main event. 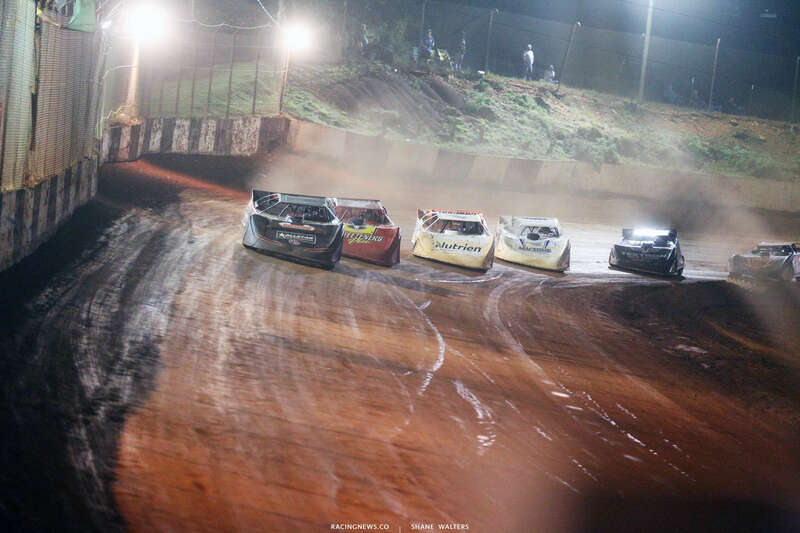 A four wide salute for the dirt late model fans at Rome Speedway. We’re ready for the starting line. 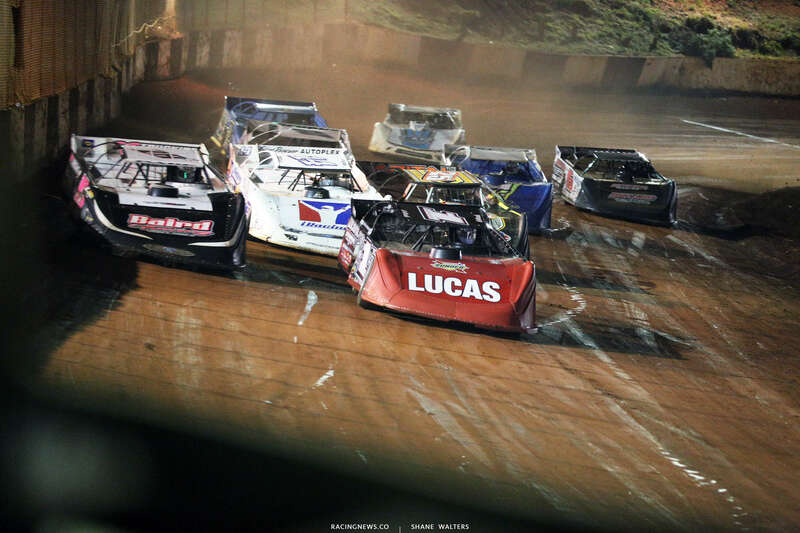 Green flag, Bloomquist runs wide into turn one. Pearson leads on the bottom. False start. Green, Bloomquist leads on the bottom. Owens is working Pearson for 2nd. He’s holds him off. Laps later, Owens looks to the high side. He’s got a run. Owens is at his right rear. Owens to 2nd. Lap 8, the caution is out. Clanton has a flat. 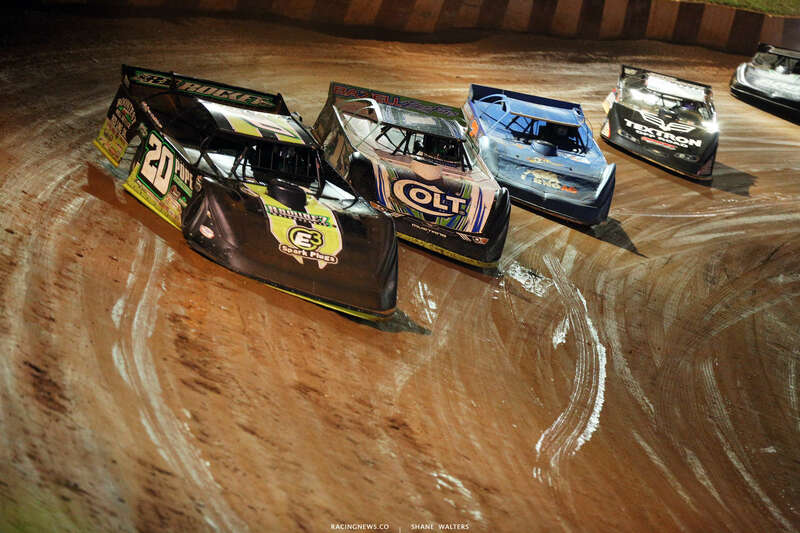 Green, Bloomquist leads into turn one. Madden is coming around the top. He can’t get there. Lap 10, same thing. 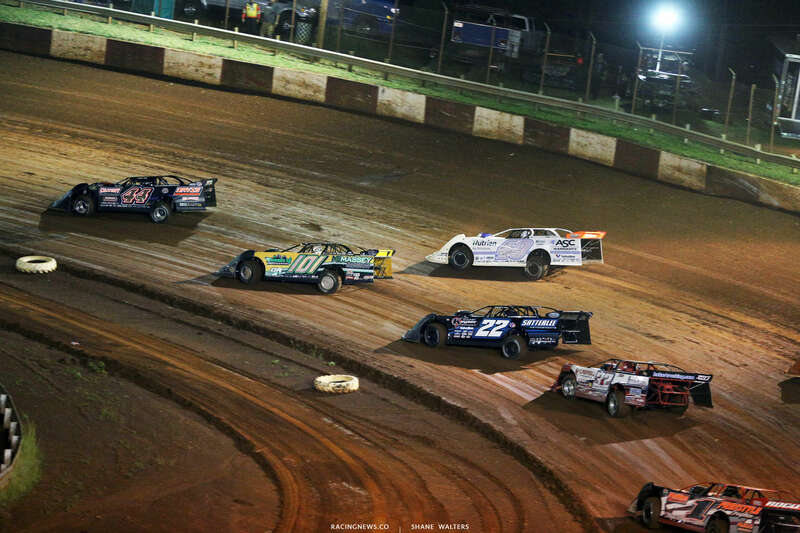 This time, Madden is at the right rear of Bloomquist off turn two. 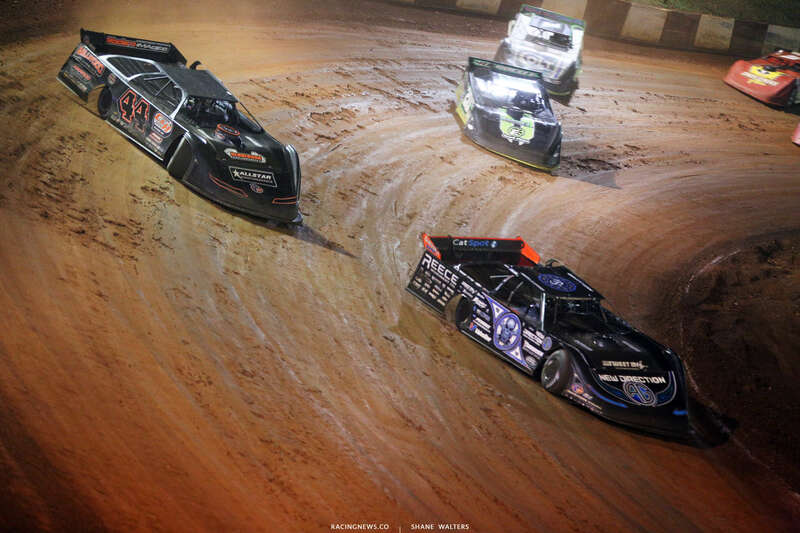 Bloomquist leaves the lane open. Madden powers by on the outside down the back stretch. Madden leads and drops to the bottom in turn three. Lap 14, Satterlee is slow on track. The caution is back out. Green, Madden leads. Millwood runs wide into turn one. Davenport has to check up behind him. Josh Richards moves to 3rd. Lap 22, Zeigler is stopped in turn four with a blown motor. The caution is out. Green, Madden leads. Richards gets the jump on Bloomquist on the outside. Owens is slow on the front. The caution is back out. Green, Madden leads. Richards holds 2nd. 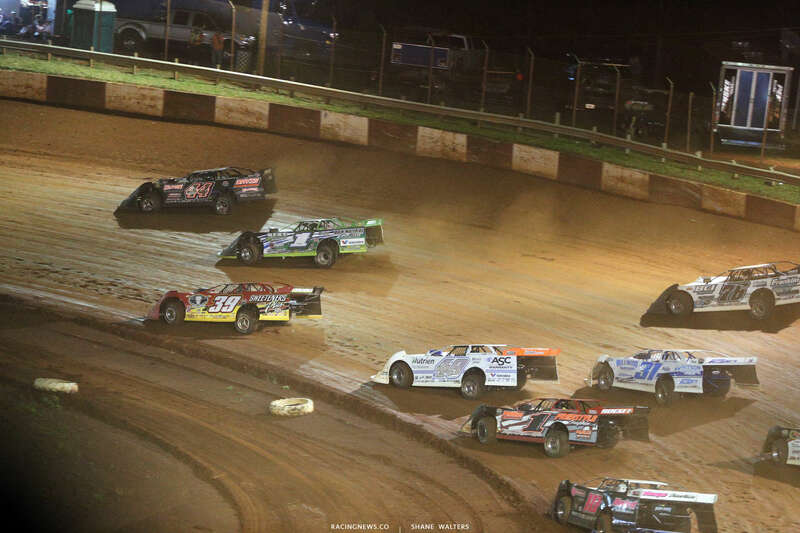 McCreadie has a run on Bloomquist on the bottom off turn two. McCreadie to 3rd. Lap 27, Bloomquist is slow in turn four. The caution is back out. Green, Madden leads. Richards is looking to take the spot on the bottom. Madden holds him off. Lap 33, Overton has a run on McCreadie off turn two. He’s clear into three. Overton snatches 2nd from Richards. Lap 36, Overton slides Madden in turn three. He comes across his nose. Madden crosses under him off turn four. Madden back to the lead in turn one. Lap 37, Richards has parts flying from his car down the back. He slows, caution. Green, Madden leads. McCreadie moves to 2nd on the bottom. Caution. Green, Madden leads. Overton to 2nd. Next lap, McCreadie has a run on Overton off turn four. He wins the race to the bottom in turn one. McCreadie reclaims 2nd. Lap 42, Overton has a flat! The caution is back out! The moves Davenport to 3rd. Green, Madden leads on the top. He runs the cushion with McCreadie all over his bumper. Lap 47, the leaders run nose to tail. McCreadie drops to the bottom in turn one to try and make that lane work. It doesn’t. Lap 49, Don O’Neal is slow on the front stretch. The caution is out. Green, Madden leads. McCreadie is back on his bumper. He’s holds them off. Chris Madden wins at Rome Speedway! 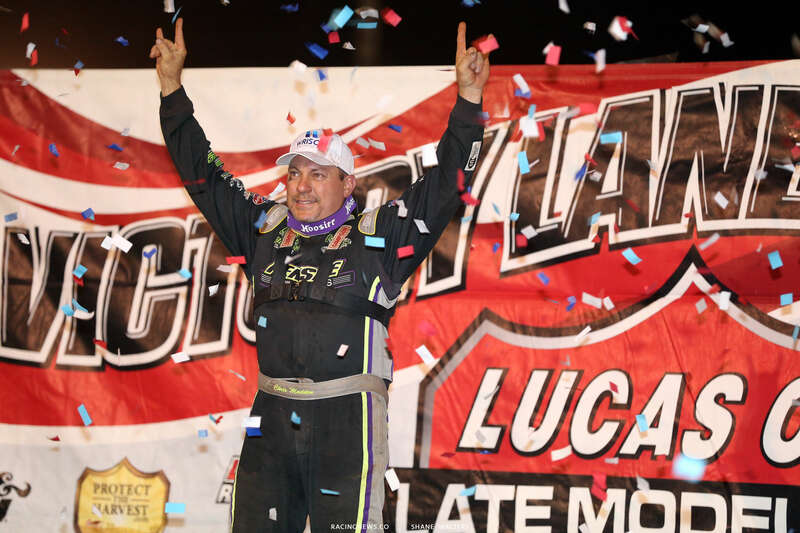 View Lucas Oil Late Model Dirt Series results from Rome Speedway below.